Sunday saw the legendary Jazz at the Philharmonic concerts, started in 1944 by producer Norman Granz, meet Jazz at the Apollo by way of Newport Jazz Club. 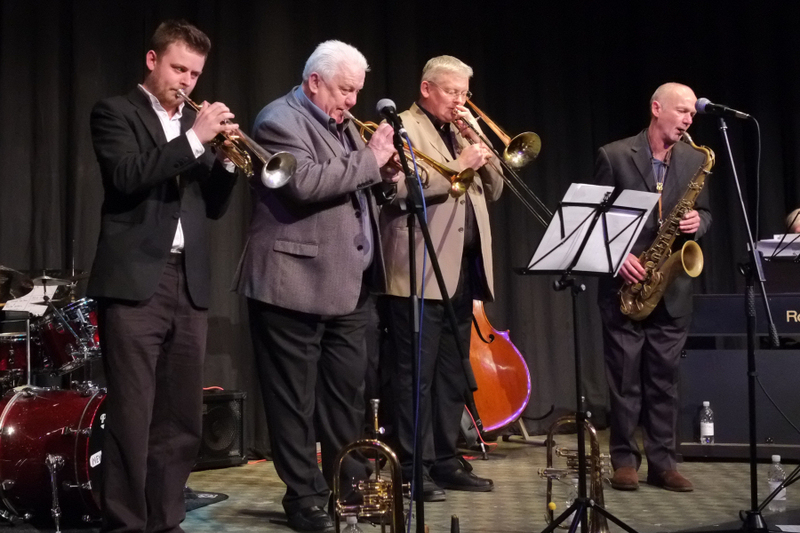 With some of the best known names in British jazz in the front line the concert opened with a blistering performance of "Perdido" before an equally stunning performance of "Broadway". The front line was led by Bruce Adams (trumpet) with Janes Copus (trumpet), Mark Nightingale (trombone) and Gary Plumley (tenor sax) all providing strong support. This also happened to be the anniversary of the death of Norman Granz and it would be hard to think of a better tribute that could have been made. There were showcase pieces for all with Gary and James sharing centre stage in the first set with "My one and only love" with Bruce and Mark sharing second set honours with "Skylark"
Support was provided by Peter Truman (piano), Mike Whitehead (bass) and Bill Wills (drums). Further concerts on this theme are planned for 2016 and judging by the audience reaction on Sunday these are not to be missed.